The Republicans have tried everything to stop Trump. But every time they attack Stubs* he only seems to grow stronger. Allow me to humbly suggest that we’ve finally found Trump’s kryptonite: This elderly Wisconsin woman holding up a meme she printed off the internet. Today groups of protesters gathered in places like Janesville, Wisconsin to denounce what they see as Trump’s racist and borderline fascist policies. This woman not only brought her copy of the US Constitution, she also brought a glorious meme. 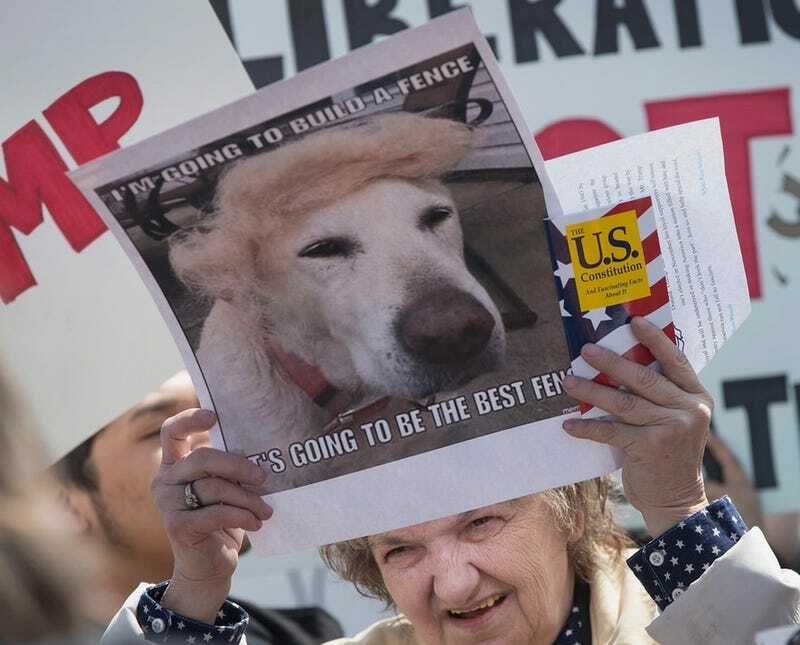 The meme shows a photo of a dog in a Trump wig and says, “I’m going to build a fence. It’s going to be the best fence.” It’s funny. Because Trump said he’s going to build a fence. And that dog kinda looks like Trump in that wig. And dogs... well, they don’t love fences. But the meme has layers, y’know? I sincerely love Wisconsin and this woman is an American hero. Keep fighting the good fight with the only thing that we haven’t yet tried: IRL memes. *Stubs because of his short stubby fingers, do you get it?